I will try to present some of my thoughts here on Darwinex Investing environment as reaction to heated debate over recent changes in DarwinIA competition. Darwinex is using DarwinIA as a tool to find and attract quality traders to Darwinex. Quality traders tend to bring investors and more AUM. All this results in more commisions and more profits for Darwinex. Everyone is happy. But I think that Darwinex realized that DarwinIA in its current state is not sustainable business for them anymore. I do not see the bottom line but my assumption is that it is not great. I like DarwinIA and options it gives me. But let me look at this from Darwinex point of view. My opinion : Darwinex made HUGE mistake with the size of allocations in DarwinIA. I am a trader. I want to generate income from trading. Let's say that I can achieve 20% performance annually. I can trade my own account or get investment. Trading my own account will not help even if I have $5,000 or even $10,000. That would give me $1,000 or $2,000 annual profit. I can't pay my living expenses with that. To make that money with 20% annual profit, I need to manage $300,000 AUM (for $1,000 monthly) or $600,000 AUM (for $2,000 monthly). Some people are happy to at least get some additional income from trading so they would be happy with less AUM. So where do I see this HUGE problem? It is much much easier and faster to get money from DarwinIA than from investors. And I will keep allocations for 6 months and I will not lose AUM after small drawdown. It is hard to keep investors AUM for longterm. There are not many investors coming in and overall invested AUM has been stagnating for long time now. Bigger investors also will not come to Darwinex so I don't think AUM will rapidly grow over next few years. Problem is with how traders trade in Darwinex. But this is topic for another thread. Let's look at some numbers. How many Darwins get how much money and from where. Only around 5% of Darwins have over $20K from Investors. So get your Dscore above 60 and keep trading and you get your Allocations. That is not hard. To get invested from other people is much muhc harder for many reasons. We all know what they are. Most investors want small drawdowns, great performance and almost no losing months. And there is only so much money available on Darwinex yet. So I think that the size of DarwinIA allocations is very high in comparison to how much trader can expect to be invested from investors at the moment. We have only few Darwins with very high AUM but majority of Darwin providers see that to get over 100K AUM is very hard. To get 100K or even 50K from DarwinIA is easy once you get your Dscore high enough. Now Darwinex may take some of that allocation if you don't have certain amount of equity and traders complain. Traders have been given too much to start with and now they protest. I see huge imbalance between DarwinIA AUM and Investors AUM and how hard it is to get it. So no wonder that you get many traders attracted to collect allocations with very small accounts. It is great opportunity to make money without making too much effort to look for investors and without having huge equity. But it is bad business for Darwinex. It would be interesting to know how much of money in Hall of Fame has been generated from DarwinIA and from Investors. Or to see % of profts made from DarwinIA per Darwin Provider. I'm reacting on @CavaliereVerde comment that he made 90% of profits from DarwinIA. 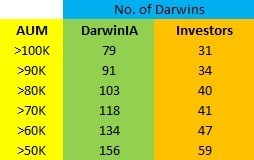 Can someone calculate and compare total AUM comeing from Investors and total accumulated AUM from DarwinIA? I think there will be huge imbalance. DarwinIA allocations are much higher if compared to Investors AUM (see picture above) and this could push Darwinex in the corner. Now they are trying to fix this. They will make some mistake along the way but I think that they have to do it. And we traders must be patient if we want to have Darwinex around for many years to come. I am happy for DarwinIA tool but as many traders mentioned on the forum, it should not be main motivation why trader comes to Darwinex. But until it is much larger than potential AUM from investors I am afraid it will stay the main motivation for traders to come here and make money from trading. I think the best way is to play long term game to focus on Investors AUM. And if in the meantime there can be some money be made ffom DarwinIA allocations than that is nice addition. This is very complex situation and it will take time and maybe even some unpopular changes before we arrive into place where traders generate most of their income from Investors AUM and not from DarwinIA allocations. Could be the solution that Darwinex should spend more money on attracting more AUM from investors than focusing on DarwinIA to attract quality traders? Would traders focus on DarwinIA so much if there were twice as many or even more Darwins getting $50K or >$100K from Investors rather than from DarwinIA? I realize that I may not have all the information needed to make opinion on this matter so I am looking forward for others opinions. It is much much easier and faster to get money from DarwinIA than from investors. And I will keep allocations for 6 months and I will not lose AUM after small drawdown. It is hard to keep investors AUM for longterm. This is what I felt. Why go thru all the tough work of finding my own investors and keeping them incessantly satisfied and emotionally stable when I can get a reliable and fixed investment thru Darwinia with (supposedly) fixed rules for achievement and no need to communicate with anyone. Wham, Bam, thank you ma'am! Clean and simple. I thought they had their business model, marketing plan, budget, and connections in the finance markets all worked out by now, so I was a bit surprised when they seemed to be struggling and needing to change their very MISSION, VISION, and biggest unique draw card in Darwinia. I hope they are still making good overall profits from their profit sharing with traders who are managing their capital thru the 6 month allocations. But I think this past year has hurt them financially with ESMA leverage changes and also with Top DARWINs not performing well on average (these had received much of the Darwinia capital too I assume). I was hoping that I could focus on trading well and my admin tasks, and then that Darwinex would serve as one more Professional Platform that would give my strategy exposure and credibility. I'm a trader. I don't really want to have to deal with communications, on-boarding, marketing, and compliance. There are not many investors coming in and overall invested AUM has been stagnating for long time now. Yes I had noticed that, and for this reason I am trying to promote my strategy on Trading Forums and Blogs, but it really takes huge amounts of time and focus and energy that I should be pouring into trading. I now finally have some interest from corporates, bigger investors, and brokers after 2 long years just scraping by financially. Exactly.. Darwinia is the biggest draw for traders and it is why it is generating so much buzz. Shouldn't be so for much longer. No. I am sure most traders just want a boost in their trading capacity financially, it doesn't matter where it comes from. To get invested from other people is much muhc harder for many reasons. We all know what they are. Most investors want small drawdowns, great performance and almost no losing months. Your point above is a HUGE one. I think more emphasis should be placed on educating investors. The situation where investor money is hugely inconsistent is one of the main reasons why Darwinia draws a lot of heat. A trader that sees investors jumping in on highs and jumping out as quickly as possible in small drawdowns will be more concerned with how to win Darwinia so any changes to the program is bound to draw angst. This is an exchange of course so won't be practical to handhold anyone. However, it is perhaps time to channel some of the policies towards investors, their behaviours, education etc. If this is done, the current pool of investor money will most likely be spread out better, yield better returns, hence attracting even more investors. Using my Darwin as an example, it could end the year above 40%, yet some of the few investors that came on board (some of them as early as March), left with very avoidable losses. It is demoralising for the trader. If I was in contention for Darwinia, I would probably be more angry than most at the Darwinia changes because it would have been my only shot at making any decent money on performance fees this year! My DARWINs have earned 71,857.08 € performance fee, and I made 15,676.82 € from DarwinIA. So 21.8% of the profit comes from DarwinIA allocations. As every month DarwinIA allocates 4 million euros to winners for management for six months, the total AUM from DarwinIA is 24 million euros at any moment. However, DarwinIA rules have changed this month, so I guess the total AUM from DarwinIA will probably decrease in the coming months. Darwinia is the only way if you don't have 3 years of perfect trackrecord with 100% return and 10% DD .